What are we sensing tomorrow? Monitoring sensors to protect your strategic assets. In a world of increasing difficulties and competition the smart sensing systems are the new effective resource capable to ensure a better preservation of ancient buildings and historical heritage, increased safety for bridges and infrastructures, an early hydro-geological and environmental warning and rationalize the resources for restore and maintenance. What are your measurement needs? Our team of engineers, metrologists and installators is just waiting to study the solution that can result more effective, less invasive and most cost-effective, exactly taylored on the actual requirements of each single project. Just because the mission of Sestosensor is to provide handy solutions with high innovation contents. Allowing your business to grow following the most complete advantage of your customers. Rome, Apr 16, 2015: The new distributed sensing technology project Brillouin 2.0 from Sestosensor has been awarded at the European Photonics Venture Forum (EPVF) The event was initiated by the Europe-funded entrepreneurship programme Lightjumps, the European Photonic Industry Consortium (EPIC) and high-ranking members of European photonics organizations. We are looking forward to be soon on the market with the new award-winning technology. Stay hungry! 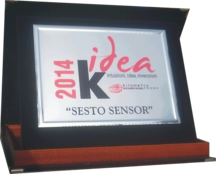 Bergamo, Nov 21, 2014: Sestosensor has been awarded the K-idea 2014 prize for a new fiber optic distributed sensing solution.